This is my first post, so please forgive me if it is in the wrong place or has been duplicated. I am looking for some pictures of the Iranian army as it would have been during the invasion by the British and Soviets in 1941. I have found a few on the web, but my Persian is not up to a proper search. Any help would be appreciated. Your posting is fine and it looks like you are a history buff. The invasion was the Allies Invasion of Iran, do not forget USA because if it wasn’t because of USA, the complete plan of using Iran as “The Bridge to Victory” would collapse, furthermore, the whole world of today would have been speaking German and residing under the Nazi boots! USA is the reason that both WWI and WWII has been won by the Allies and as the American politicians love to say: “God Bless America”! Imagine if USA did not enter the war, you could have been speaking German in London today! Imagine that if you can?! The reason is that German architects, engineers, military attaches and other consultants were ordered by Reza Shah to help him build the new Iran. On the surface and officially Iran was neutral but in reality Iran was always a German sympathizer and Reza Shah admired the Axis and Hitler. In both WWI and WWII, Iran was a German sympathizer because of the long history of the Anti British and Anti Russian feelings of the Iranians due to the colonial intentions of UK and Russia for Iran. Persians by majority were always Germano-Feel. Also have in mind that Persians and Germans are both Aryans. 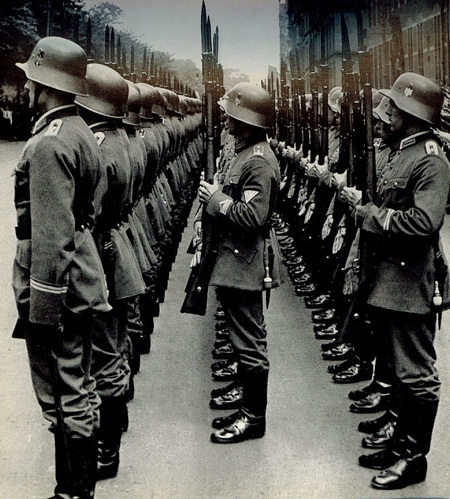 Hitler specifically referred to Persians as fellow Aryans. Persians being Aryans does not mean that every Iranian is Aryan, well look at Ahmadinejad, Rouhani and the IRI Regime officials, they are more likely half breed Arabs and very similar to Baboons in the mist! In the future I shall publish more Iranian uniforms during WWII in the proper articles and books which will be published in IPC. Until then, stay tuned. So are you Persian? Were you born outside Iran? I am not sure about the validity of these pictures you posted and the validity of the sites which they were published in! and they look nothing like Afghan Royal Guards! They look more like Nazi German uniforms. As I stated, I will publish more on a later time. Notice Persian Aryan Salute by Reza Shah?! I'm neither Persian, nor born in Iran. I'm a Geordie, born in Northumberland! I was fortunate enough to grow up in a household where world-events (such as those in Iran during 1978/'79) were discussed. Thank you for your responses to my initial post. I look forward to your publishing more pictures when you are able.